Morning all I am a bit late this morning. the patterned stamp then added the bird. on the little tag and added red lettering. So thats a quick blog for today. 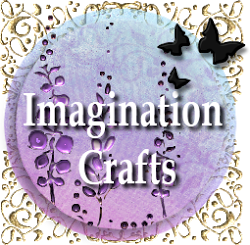 do with the Imagination crafts products. to spend in the shop. Fabulous - I love the bright colours of the feathers and lace - stunning!! Awesome tags Nicky. I need to try the sparkle medium. Thanks for sharing. Gorgeous tags Nicky. Love the addition of the feathers. Lovely tag. I love the stencil work on both elements. The main tag backing is very subtle and the stencilling on the removable part stands out beautifully.